Dr. Anthony Fauci, director of NIH's National Institute of Allergy and Infectious Diseases, said today he "would not have recommended" mandatory quarantines for medical workers returning from West Africa to the U.S. He said he does not believe the Centers for Disease Control and Prevention should change its policy recommendations. This week, after Dr. Craig Spencer returned from Guinea to New York City and was diagnosed with Ebola, Republican New Jersey Gov. Chris Christie and New York's Democratic Gov. Andrew Cuomo announced they would institute a mandatory 21-day quarantine for health care workers returning from West Africa who had contact with those suffering from Ebola. But today on "This Week," Fauci said he would not have supported the quarantine had he been consulted about the decision. "As a scientist and as a health person, if I were asked I would not have recommended that," Fauci said. "The CDC will continue to make their policies based on scientific data," he added when asked whether there should be a national policy. Fauci also said he could not explain the alleged poor treatment of a nurse returning from West Africa who was subject to the recently installed quarantine in New Jersey and who said she felt treated like a "criminal" by authorities. "I cannot explain that, Martha," Fauci told ABC News' Martha Raddatz. "I can just tell you that what we want to do is to make sure first, protect the American public, but do so based on scientific data, where we keep repeating over and over again, the scientific data tells us that people who are without symptoms, with whom you don't come into contact with body fluids, are not a threat, they will not get infected." Kaci Hickox, who had been working in Sierra Leone, returned to the U.S. Friday and wrote about her experience for dallasnews.com, saying, "This is not a situation I would wish on anyone, and I am scared for those who will follow me." "The scientific evidence is what needs to drive us," Fauci said in response to the case. "We appreciate the fears of the American people, but you don't want to have policy that would have negative unintended consequences." 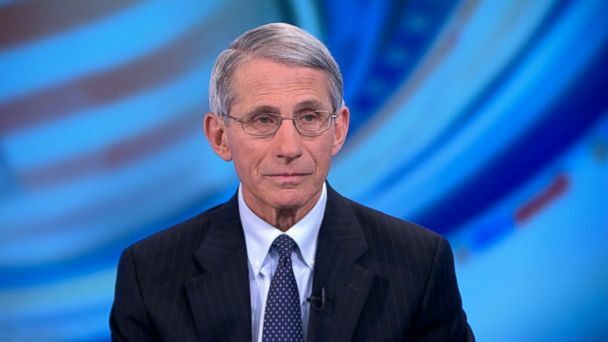 Fauci said he was concerned that such quarantine restrictions could discourage health care workers from traveling to West Africa to help combat the spread of Ebola. "There are different levels of risk to a health care worker, and that there are different levels of monitoring," Fauci said. "If you put everyone in one basket, even people who are clearly no threat, then we have the problem of the disincentive of people that we need. "Let's not forget the best way to stop this epidemic and protect America is to stop it in Africa, and you can really help stopping it in Africa if we have our people, our heroes, the health care workers, go there and help us to protect America," he said. "We can't lose sight of that." Like "This Week" on Facebook here. You can also follow the show on Twitter here.Go here to find out when "This Week" is on in your area.